An operative of the Economic and Financial Crimes Commission has revealed how to fraudsters cloned the phone of an aide to a former Custom's boss and stole money. 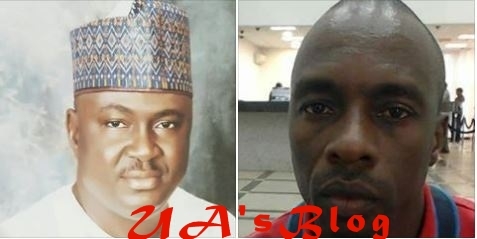 The trial of Balarabe Abdullahi and Usman Baba Yusuf (currently at large) who are being prosecuted by the Economic and Financial Crimes, EFCC, for cloning the phone number of Abdulmumini Bako, a former Special Assistant to the former Comptroller General of the Nigeria Customs Service, Abdullahi Dikko Inde, continued on March 5, 2018 with the prosecution presenting its third witness. Naziru Aminu Shehu, an operative of the EFCC, who testified against them before Justice D.Z. Senchi of the Federal Capital Territory, FCT High Court, Jabi narrated how the defendants cloned the number, registered it as YouYoulili and used it to defraud officers of the Customs Service. He further told the court that under interrogation, Balarabe admitted that the, “Access Bank ATM card bearing the name Balarabe Musa belongs to him and that it is the ATM card for the account in which he received the proceed of N2 million that the victims sent ". Balarabe, according to Naziru, confessed that he stopped using the MTN phone number after receiving the N2 million, based on instruction from Yusuf. According to Naziru, investigations into the shady activities of Balarabe and Yusuf, made investigators to extend their searchlight to First Bank Nigeria Plc, after payment slip linked to Yusuf were found in his car. He said: “We then wrote to the bank for more information and also placed a no-debit on the account and ordered the bank to arrest whoever was the owner of the account whenever he appears. Naziru revealed that investigations indicated that “the phone number was registered with a name that does not belong to a human being as it carried the name YouYoulili” noting that the address was traced to Kano State where the defendant was based. He added that two messages were sent to the victims of the fraud, using the phones of Bako, but “there was no sender, time, details of the phone model and where the message was sent from”. Subsequently, the Access Bank ATM card was admitted in evidence as Exhibit 2, the Glo SIM pack as Exhibit 3, five MTN SIM packs as Exhibit 4, five MTN SIM cards as Exhibit 4a, three SIM packs as Exhibit 5, First Bank slip as Exhibit 6, letter of assistance to the bank as Exhibit 7, and the search note as Exhibit 8. The matter has been adjourned to March 8, 2018 for continuation of trial.